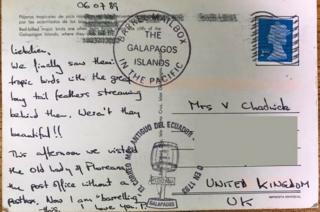 Two postcards have finally arrived in England 30 years after being posted from the Galapagos Islands. The Ecuadorean islands are famous for their slow-moving giant tortoises, but it seems even they could have made the trans-Atlantic journey more quickly. Peter and Varna Chadwick sent the mail to their former home in Oldham, Greater Manchester, while on holiday in 1989. They were reunited with the cards after being traced by the current owner of their old house, Kevin Thewlis. Mr Thewlis was initially puzzled to receive the postcards last month and set about tracking down the Chadwicks, who now live in Stockton-on-Tees, through a neighbour who had a forwarding address for the couple. By the time they saw the postcards again, 353 months had passed. Even the islands' giant tortoises, travelling at a typical speed of 0.16 mph, could have delivered the postcards faster - taking just over four years to cover the equivalent distance of 6,000 miles (10,000km). Mr Chadwick said he was "absolutely thrilled" and "ever so grateful" to be reunited with the cards, which were sent as part of their tradition of posting cards to themselves from their holidays. The postcards were sent via the islands' barrel post system. Dating back to the 19th Century, barrel post was used by whalers and relied on post being picked out of beachside barrels and taken on the next step by islanders heading in the right direction. The cards arrived in Oldham bearing the 'South Lakes' stamp applied to mail posted in parts of Cumbria. Mr Chadwick said he believed the postcards may have been brought back to England years ago before they were discovered and sent forward. "Someone must have stuck them in a file intending to post them and then come across them 30 years later," he added. Image caption The couple said the postcards had brought back "wonderful memories"